Osteoporosis is often considered a female condition. As a woman enters menopause, hormone levels drop and bone mass slowly depletes; women are not the only ones who suffer from osteoporosis. 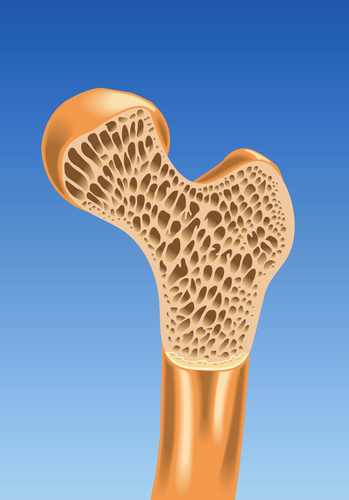 Men over the age of 50 are at increased risk of low bone mass and osteoporosis. Why is osteoporosis considered a female disease? Surprisingly, the only reason men suffer from osteoporosis less often than women is skeletal density and size. Men have larger, thicker skeletons so bone loss takes longer to have a negative effect. Women, on the other hand, have smaller skeletons so bone loss causes more noticeable side effects, sooner. How many men are affected by osteoporosis? It is difficult to pinpoint an exact number of men who suffer osteoporosis, but what we do know is that as many as 1/3 of all hip fractures occur in men. After men reach the age of 50, at least 6-percent of men are treated for hip fractures as a result of osteoporosis. Another amazing statistic is that more than $2 billion in health costs each year are directly related to male osteoporosis. Osteoporosis is caused by bone loss. Women lose bone mass faster than men, thus the attention given to osteoporosis in the female population. Around age 70, men have lost enough bone mass to affect bone health and increase risk of bone fractures, particularly in the hips, wrists and spine. What are the risk factors of osteoporosis in men? Men with chronic health conditions, low testosterone and a family history of osteoporosis are at increased risk of the condition. Lifestyle habits like smoking, drinking and lack of daily exercise are also factors. White men tend to be affected by osteoporosis more often than any other race. There is no way to reverse the bone loss that occurs with age. Medications, lifestyle changes and dietary changes can help prevent additional bone loss. New medical treatments and research are looking into the effects of exercise and some medications on bone density and bone health. Osteoporosis is not a condition that only affects females. Men are just as likely to suffer bone loss as women and, in some cases; the outcome of bone loss is more likely to be fatal. Men who suffer a hip fracture are more likely to have fatal complications than women who suffer a hip fracture. It is best to maintain a healthy, high-calcium lifestyle, exercise daily and have bone density tested.